Did this North Korean cheerleader accidentally cheer for an American? North Korea’s participation in the PyeongChang Winter Olympics has raised eyebrows on a number of fronts. Has the North’s presence at the Games been an important first step on the road to reunification? Or just thinly veiled propaganda packaged as a charm offensive? Whatever you may choose to make of it, one of the more bizarre aspects of the North’s participation in the Games has been the squad of cheerleaders that have appeared in the crowd at events DPRK athletes have competed in. 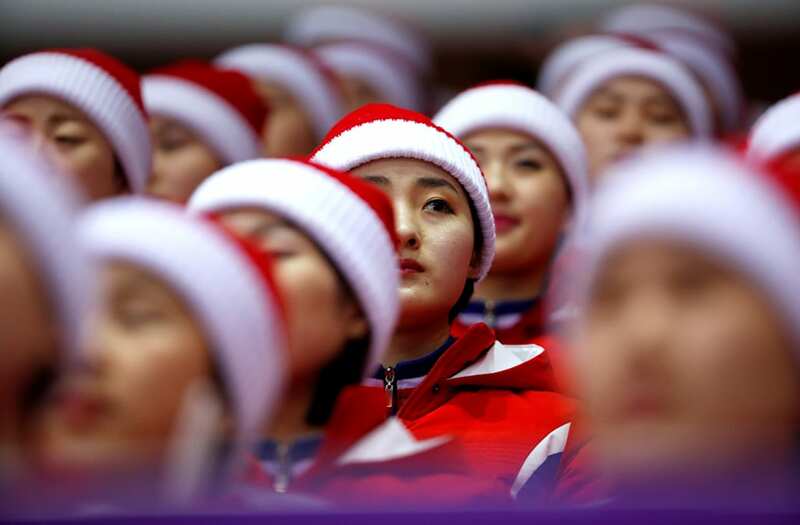 While the closely choreographed, synchronized routines performed by the North Korean “army of beauties” is undeniably impressive on some level, their pasted on smiles and near-frantic enthusiasm have an ominous, Orwellian quality. Closely attended by older, impassive male minders, the cheerleaders’ presence has led to more than its share of awkward moments at the Games. Among them is this video, which appears to show one of women accidentally begin to clap for American figure skaters Alexa Scimeca Knierim and Chris Knierim. As you can see in the video, the entire brigade of cheerleaders erupts with their usual near-hysteric level of forced exuberance to applaud North Korean figure skating duo Ryom Tae Ok and Kim Ju Sok. But then as the Knierims take the ice and are introduced for their routine, one of the North Korean cheerleaders appears to momentarily forget herself. Instead of remaining deadpan and disinterested, as the women typically have during performances by athletes from other nations, she breaks protocol and briefly, begins to clap for the Knierims. This causes the woman sitting to her immediate left to also momentarily break character. Maintaining her neutral expression, she nudges the rogue clapper several times with her elbow. The clapping woman turns to face her and, as if she’s not quite realized what she’s done, seems to mouth a word to her. The other woman tries desperately to play it cool, her lips moving ever so slightly as she assumedly mouths the North Korean expression for “cut it out” under her breath. It all happens very quickly, but it offers a telling glimpse at what lurks behind the facade of smiles and flag-waving euphoria the cheerleaders have attempted to present wherever they’ve appeared.